Here's What You Can Do now to help influence the situation. Download this report and all its documents (video and mp3 excluded) as a zip file. Although things are just heating up over the last week, the events in question took place over two weeks ago, on December 10, 2004. According to a signed affidavit by Sherole Eaton, Hocking County Deputy Director of Elections, Triad employee Michael Barbian, dropped by, free of charge, to "check out your tabulator, computer, and that the attorneys will be asking some tricky questions and he wanted to go over some of the questions they maybe ask." In her affidavit, Eaton also claims that Barbian worked unsupervised on one or more recount machines for over two hours. She also states that: "He advised Lisa and I on how to post a "cheat sheet" on the wall so that only the board members and staff would know about it and what the codes meant so the count would come out perfect and we wouldn't have to do a full hand recount of the county." According to a December 20th Wired article written by Kim Zetter, when Wired contacted her for comment, Eaton tried to downplay her statements, saying that they were blown out of proportion, and that she only filed the affidavit in order to prove that no wrongdoing had occurred. However, the affidavit itself seems to do just the opposite, by explaining the details surrounding the Triad techician's unsupervised handling of at least one, and perhaps more than one recount machine, and the existence of a "cheat sheet" in order to assist recount officials with deriving the "right answer" for vote tallies so they wouldn't have to actually conduct a recount by hand. In a video interview with Triad staffer Michael Barbian, he confirms that the recount machines were taken completely apart and put back together and reprogrammed with new software without any of the supervision required by Ohio State Law. He also says that he has done the same thing in several other counties. Representative John Conyers (D-MI), the ranking member of the House Judiciary Committee, Rep. Maxine Waters (D-CA) and Rep. Stephanie Tubbs-Jones (D-OH), have been the only three of our elected representatives to take the last two months of voting fraud allegations seriously. They conducted a Judiciary Democratic 2004 Election Forum in Washington DC on December 13, 2004, and continued with more hearings in Ohio for many days afterwards. On December 22, after viewing the video, Conyers wrote a letter to Brett Rapp, President of Triad Systems, and Michael Barbian, asking them to explain their actions in Hocking County on December 10, 2004. On December 23, Conyers learned that Triad Systems had remote access capabilities to the voting machines in numerous counties, prompting him to send a second letter to Rapp and Barbian inquiring about these capabilities and how exactly they were utilized by Triad during the recount. According to a letter from Rep. John Conyers (D-MI) to Kevin Brock, Special FBI Agent in Charge of the Democratic Staff's investigation into irregularities in the 2004 election, and attorney Larry E. Beal, Hocking County Prosecutor, three federal laws and five Ohio State laws could have been violated by Triad's behavior. (Section 3515 of the Ohio Revised Code) "The board must randomly select whole precincts whose total equals at least 3% of the total vote, and must conduct a manual count." "If the tabulator count does not match the hand count, and after rechecking the manual count the results are still not equal, all ballots must be hand counted. If the results of the tabulator count and the hand counted ballots are equal, the remainder of the ballots may be processed through the tabulator (for optical scan and punch cards)." 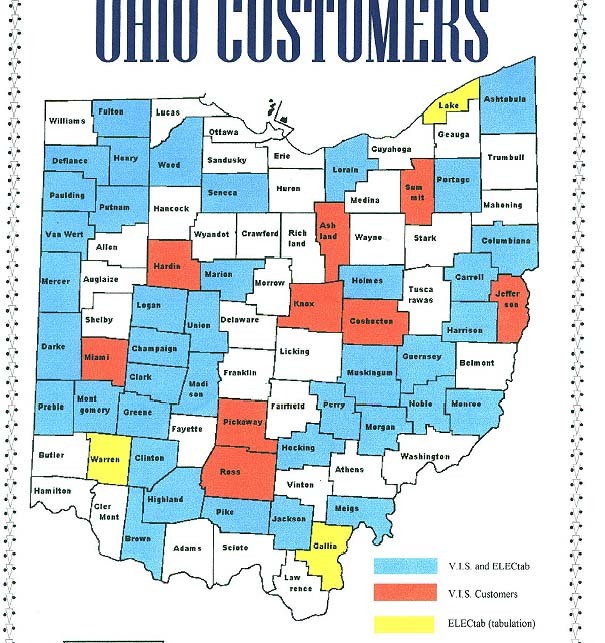 I am concerned that your company has operated - either intentionally or negligently - in a manner which will thwart the recount law in Ohio by preventing validly cast ballots in the presidential election from being counted. You have done this by preparing "cheat sheets" providing county election officials with information such that they would more easily be able to ignore valid ballots that were thrown out by the machines during the initial count. The purpose of the Ohio recount law is to randomly check vote counts to see if they match machine counts. By attempting to ascertain the precinct to be recounted in advance, and than informing the election officials of the number of votes they need to count by hand to make sure it matches the machine count is an invitation to completely ignore the purpose of the recount law. Rapp: "Remember: the purpose was to train people on how to conduct their jobs... and to help them identify problems when they conducted their recount... If they could not hand recount the ballots correctly, they would know what they needed to look for in that hand count." Observer: "Why do you feel it was necessary to point out to a team counting ballots the number of over-votes and under-votes when the purpose of the team is to in fact locate those votes and judge them?" Barbian: "It's an easy mistake as you're hand counting... It's just human error. The machine counts it right. We're trying to give them as much information as possible to help them out. Interviewer: "You were just trying to help them so that they wouldn't have to do a full recount of the county, to try to avoid that?" As of the time of this writing, Triad had not responded to either of Conyers' letters. Although the Kerry/Edwards campaign had sent official recount rules to each individual Board of Elections in the state of Ohio, it had remained relatively quiet throughout most of the process. "Senators Kerry and Edwards are very concerned that the law for conducting the recount should be uniformly followed. Only then can the integrity of the entire electoral process and the election of Bush-Cheney warrant the public trust." On Monday, December 27, 2004, the Kerry/Edwards presidential campaign filed two important motions to preserve and augment evidence of alleged election fraud in the November election. Note: not only in the recount, but in the election itself. As truthout explains: "Specifically, Kerry will be filing a request for expedited discovery regarding Triad Systems voting machines, as well as a motion for preservation order to protect any and all discovery and preserve any evidence in this matter." The "Yost" lawsuit is the one brought about by David Cobb and the Green Party. There is another suit that has been filed against Bush, Cheney, Rove, Moyer, and Blackwell that is a separate matter. The motions were filed in the matter titled Yost et al. v. Delaware County Board of Elections and J. Kenneth Blackwell (Civil Action No. C2-04-1139) with the U.S. District Court for the Southern District of Ohio. The document is titled "Motion Of Intervenor-Defendant Kerry-Edwards 2004, Inc. For A Preservation Order And For A Leave To Take Limited Expedited Discovery." The purpose of the motions is twofold: A) To preserve all ballots and voting machines pertaining to the Yost matter for investigation and analysis; and B) To make available for sworn deposition testimony a technician for Triad Systems, the company that produced and maintained many of the voting machines used in the Ohio election. The technician has been accused of tampering with the recount process in Hocking County, Ohio, though other counties are believed to have also been involved. Any officers of Triad Systems who have information pertaining to said tampering are likewise subject to subpoena for sworn deposition testimony. Electors across the country have been watching the developments closely. Historically, we never hear much from these people, who quietly cast the votes to actually choose our President every four years. Last week, history was made, when numerous electors from across the country spoke out in favor of a full congressional investigation into the numerous alleged voting violations during the November 2 election and the recounts afterwards. On December 20, 2004, a group of electors from five different states called for a congressional investigation of voting violations during the Nov. 2 election for president. Electors in Vermont, Maine, Massachusetts, California, and North Carolina all registered their concerns as they cast their votes. On December 22, the entire lot of electors in Massachusetts passed a motion urging members of Congress to object to the vote. They also requested an investigation of "all voting complaints that might have any validity" and remedies for "any voting rights violations or electoral fraud verified by its own agents or through the courts." It is the electors' hope to get the message read on the floor of Congress prior to certification on Jan. 6, when the ballots are opened. The Greens and Libertarians filed for a recount, and got one. Trouble is, much of the recount has not been allowed to actually take place, due to constant interference by Ohio Secretary of State Kenneth Blackwell, who has been sealing off the buildings and ballots required to conduct a full recount. Blackwell is earning the reputation of being "the Katherine Harris of Ohio," and with good reason. Even though he promised in an interview with MSNBC's Keith Olbermann that he would not obstruct a recount in any way, in reality, he has done exactly that. Here's one article which details how one Ohio Recount team that had been assigned to Greene County was stopped in mid-count by a surprise order from Secretary of State Blackwell's office, where the Director Board of Elections stated that "all voter records for the state of Ohio were "locked-down," because "they are not considered public records." Ohio Revised Code Title XXXV Elections, Sec. 3503.26 that requires all election records to be made available for public inspection and copying. ORC Sec. 3599.161 makes it a crime for any employee of the Board of Elections to knowingly prevent or prohibit any person from inspecting the public records filed in the office of the Board of Elections. Finally, ORC Sec. 3599.42 clearly states: "A violation of any provision of Title XXXV (35) of the Revised Code constitutes a prima facie case of election fraud within the purview of such Title." Blackwell also took six weeks to certify the election in Ohio, which made it impossible for the recount to proceed in a timely manner. As David Cobb's website put it: "Kenneth Blackwell, who served both as Ohio Secretary of State (the man in charge of Ohio's vote-counting process) and the partisan co-chair of the Bush-Cheney Re-election Campaign in Ohio, took six weeks to certify the Ohio vote count, the same time needed by Washington State to certify the vote, complete a state-wide recount, and start a second one." Blackwell is also named in a lawsuit filed on behalf of number of civil rights groups, but Attorney General Jim Petro, representing Blackwell, is claiming that the plaintiff voters of the suit "are not trying to actually contest the presidential election but are merely using this litigation to cast public doubt on the voting system of the State of Ohio without a shred of evidence supporting their theories." The argument is that Blackwell (and, of course, the argument would carry over to the deposition of Bush, Cheney, Rove and Moyers -- the others named in the suit) is too important and busy as a high-ranking official to be deposed, and that the lawsuit is frivolous anyway. Here's an article from the NY Times explaining just how real the problems with the Ohio vote and recount are, and demonstrating how the claims against Blackwell are in no way frivolous. Unfortunatlely, only time will tell on these court cases. And, of course, time is the one thing we don't have. I wish I had a better answer for what you, or any of us, can really do to rectify this situation. What we really need is another vote in Ohio, not another, properly conducted recount. In my opinion, recounts are not good enough. A recount only gives you a better chance of having your vote counted when you haven't been deprived of casting your vote in the first place. There were, at this point in the tally, hundreds of thousands of people who were not allowed to cast their vote. These are the votes that would have made the difference in the final numbers. As was the case in Florida in 2000, these people were systematically silenced before they even had a chance to speak. You can take 30 seconds and send an email to the House Judiciary Committee expressing your concerns on the matter and asking for a full investigation. Conyers is trying to get a million emails by January 3, 2005 in the hopes of turning a few heads there. If you are in Ohio or Washington D.C., you can show up at one of the protests scheduled to happen from January 3-6, 2005. Looks like there are protests scheduled around the country for the week of January 15-20 too, but that, of course, will be after the fact with regard to the January 6 electoral votes being cast. You can send emails now to these Senators who might actually endorse the challenge scheduled to be submitted by Rep. Maxine Waters and/or Rep. John Conyers on January 6, 2005. By Ken Hoop for the American Free Press. Everything below is quoted from Representative John Conyers' Letter to Kevin Brock, Special FBI Agent in Charge of the Democratic Staff's investigation into irregularities in the 2004 election, and attorney Larry E. Beal, Hocking County Prosecutor. provides for criminal penalties against any person who, in any election for federal office, "knowingly and willfully deprives, defrauds, or attempts to defraud the residents of a State of a fair and impartially conducted election process, by . . .the procurement, casting, or tabulation of ballots that are known by the person to be materially false, fictitious, or fraudulent under the laws of the State in which the election is held." also requires the retention and preservation, for a period of twenty-two months from the date of a federal election, of all voting records and papers and makes it a felony for any person to "willfully steal, destroy, conceal, mutilate, or alter" any such record. Further, any tampering with ballots and/or election machinery would violate the constitutional rights of all citizens to vote and have their votes properly counted, as guaranteed by the Equal Protection and Due Process Clauses of the Fourteenth Amendment to the U.S. Constitution. provides "[n]o person shall tamper or attempt to tamper with, deface impair the use of, destroy or otherwise injure in any manner any voting machine...No person shall tamper or attempt to tamper with, deface, impair the use of, destroy or otherwise change or injure in any manner any marking device, automatic tabulating equipment or any appurtenances or accessories thereof." provides "[n]o person shall...destroy any property used in the conduct of elections." provides "[n]o person, from the time ballots are cast or voted until the time has expired for using them in a recount or as evidence in a contest of election, shall unlawfully destroy or attempt to destroy the ballots, or permit such ballots or a ballot box or pollbook used at an election to be destroyed; or destroy, falsify, mark, or write in a name on any such ballot that has been voted." provides "[n]o person, from the time ballots are cast or counted until the time has expired for using them as evidence in a recount or contest of election, shall willfully and with fraudulent intent make any mark or alteration on any ballot; or inscribe, write, or cause to be inscribed or written in or upon a registration form or list, pollbook, tally sheet, or list, Iawfully made or kept at an election, or in or upon a book or paper purporting to be such, or upon an election return, or upon a book or paper containing such return the name of a person not entitled to vote at such election or not voting thereat, or a fictitious name, or, within such time, wrongfully change, alter, erase, or tamper with a name, word, or figure contained in such pollbook, tally sheet, list, book, or paper; or falsify, mark, or write thereon with intent to defeat, hinder, or prevent a fair expression of the will of the people at such election. ".